The Goa College of Hospitality and Culinary Education was begun with the primary objective of grooming and developing resources for the Hospitality Industry. The College was established in the year 2011, however, the Institution has its beginnings under the name of the Academy of Culinary Education since the year 1995. The Academy was the first of its kind in the Country. The focus was to mould and create Professional Chefs the Industry could benefit from. The alumni’s contribution to the industry has been noteworthy with students who have graduated finding placements in Organizations such as the Oberoi, ITC, Taj, Hyatt, Marriott, Hilton, Radisson, Four Seasons, Cidade de Goa, Jumeirah etc. The rise of the State as a popular tourist destination with both Indians and Foreigners has led to the emergence of numerous Hotels and Resorts in the State. The demand for skilled manpower far exceeds the supply, with the result, that there is a growing concern and a definite need for resources to be provided and trained to receive skill sets required by the Industry. The need today is not only within the State but all over the World with the Industry now playing a very dominant role globally. 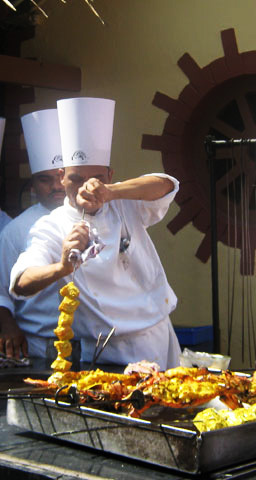 The ‘Goa College of Hospitality and Culinary Education’ from 2011 is affiliated to the Goa University and offers a course curriculum which is a blend of skills training in Food & Beverage (service), F&B (production), Front Office, Housekeeping, Management studies, Administration and Soft skills ensuring that all the requisites are equally focused to provide all rounded development to its students for the Hospitality Industry. The College has the unique advantage of being attached to a Five Star Deluxe property, Cidade de Goa thus making it convenient for its students to acquire valuable industry exposure at the shop floor.